Only modern Israeli cosmetic ingenuity could bring you this stunning development in personal hygiene. Imagine only needing to put deodorant on as often as you light shabbat candles! Lasting up to 7 days, this deodorant cream is free of aluminum, alcohol, and paraben which are harsh chemicals that irritate the skin. You can even bathe, shower, play sports, and engage in other strenuous activities and this deodorant cream will still work! Jewish tradition demands that we strive to attain our best health, individually and communally. We are to respect the very bodies God created and breathed life into, and to honor our relationship with God by treating ourselves and each other well. 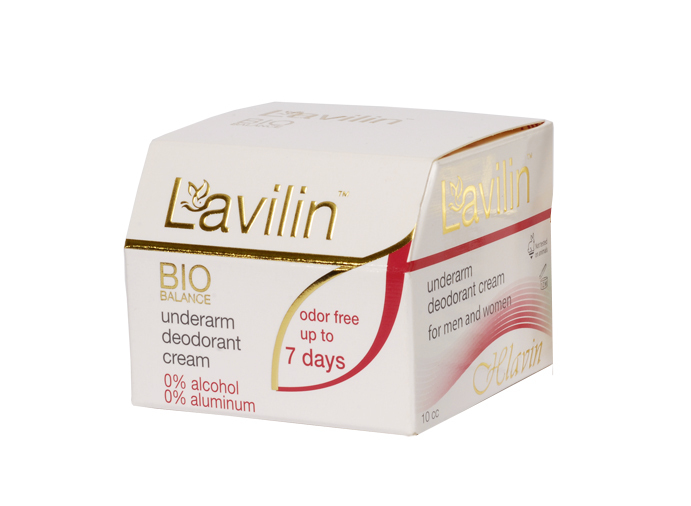 One way this can be achieved is through the use of Lavelin's more naturally-derived products such as this long-lasting deodorant cream. By putting less harsh chemicals into our body, we are prolonging our life and health, as well as that of our children and grandchildren. Ricinus Communis (Castor) Seed Oil & Hydrogenated Castor Oil & Copernica Cerifera (Carnauba) Wax, Talc (pharma), Zinc Oxide, Potato Starch (modified), lactose, milk protein, bifida ferment lysate, ethylhexylglycerin, triethyl citrate, chamomilla recutita (matricaria) extract; glycine soya, calendula officinalis flower extract, arnica montana flower extract, tocopherol, Parfum (Fragrance), O-Cymen-5-Ol.